The Ride Janie Ride Foundation would like to introduce to you four very special people. We have been blessed to meet Kylie Arnold, Kathryn Pekarik, Becca Mueller and Cameron Smith. Each of them have been diagnosed with various types of cancer. It is our honor to have them as part of the Ride Janie Ride family and we take great pride in announcing that Kylie, Kathryn, Becca and Cameron will be the recipients for Ride Janie Ride 2011. Continue scrolling to read each of their biographies. Ride Janie Ride Foundation would like to thank all of those who nominated individuals. We will not forget any of the nominees and hope that they may be a part of Ride Janie Ride for 2012. On August 27th 2009 our world changed forever when we were told that Kylie our 27th month old daughter had 2 brain tumors and 5 spinal tumors. She was officially diagnosed with P.N.E.T (Primitive Neuro Ectodermal Tumors). Her treatment consisted of six induction rounds of Chemo from Sept 2009 thru Feb 2010, High Intense Chemo with a Stem Cell Transplant on March 30th. 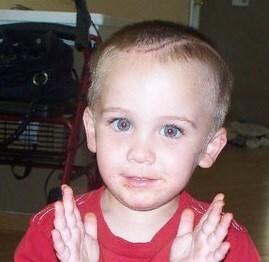 This was followed by 7 weeks of full cranial and spinal Radiation from May 20th thru July 12th of 2010. She has had several scans and biopsies throughout this time. She also dealt with a fungal infection of her liver and lungs which delayed our start for transplant. For a while I was able to work in between hospital visits but due to commitments with Kylie, I was unable to work. Kylie is a wonderful child with an amazing personality and due to all of the treatment that she had endured she has lost her outgoing and carefree spirit. All of our treatments have been inpatient and each time we would end up back at the hospital with fevers for a week or more. Due to the fact that all of Kylie's treatment were inpatient that kept me away from my son Devin who is in 2nd grade and had to stay back home with family in order to go to school. We have spent a lot of our time out of the hospital at events to help raise awareness for Childhood Cancer. In October 2009 my children's great-grandpa passed away and then in March 2010 their great-grandma passed away and they were a big support to our family. They were a big help in taking care of our kids while we were working or at the hospital with Kylie. Without these supports in our life anymore and the lack of employment, we as a family have had a very difficult time. Right now Kylie is out of treatment and we have 3 months to relax and enjoy the holidays. Kathryn has always been an advocate of exercise and healthy eating so you can imagine the shock of learning she has T Cell Lymphoma at the age of 27. As her Grandmother, I have always been grateful and proud of the time and attention she gives to family, especially my 91 year old Mother, her Great Grandmother. Her own Mother has quit her job to become a fulltime caretaker for Kathryn. Her course of treatment requires a 4-day hospital stay to receive chemo. This is done every 22 days and she has completed 4 out of the 8 planned treatments. Her Mother stays with her at the hospital during this time. However, complications have arisen between treatments requiring additional hospital stays for blood transfusions. There are also nurse's visits to the house for blood draws not to mention about 20 different medications which are taken orally. Kathryn remains as positive as possible throughout this chapter of her life, even commenting that being bald is an asset when you're cooking, i.e., you don't have to worry about hair falling into the food. Her passion for cooking and baking is a saving grace because on her "good days" this is what she looks forward to doing. Thank you for what you do and it is heartwarming to know that strangers care. 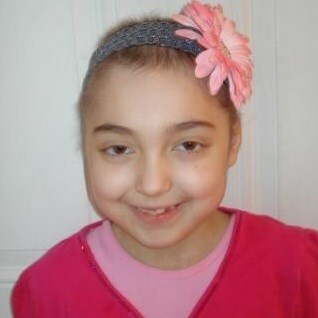 Becca was diagnosed with 2 types of Leukemia AML and ALL on August 3, 2010. She started with 99% blasts. She spent the next 3 months at Hope Hospital in Oak Lawn, through August, September and October. She is currently being treated as an out patient at the Keyser Center and Hope Hospital. We are not sure if the Doctors are going to continue with the treatment or see if she needs a transplant. We will know more at a later date. 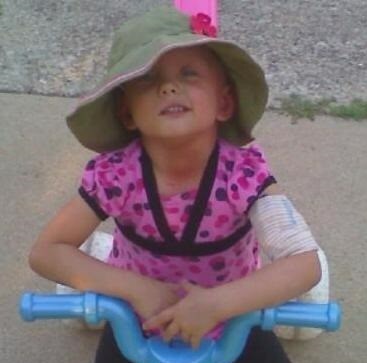 If she does not go forward with the Transplant, her treatments will be over 2 1/2 years long. Mother had to quit her job to help take care of Becca. Luckly, Becca's dad is working. Becca has one sister who is 6. We are adjusting to being home finally as a family. The past 3 months have been a struggle with the roller coaster test results. Becca's Leukemia is considered High Risk because she didn't respond to the first 2 treatments. Round 3 finally showed emprovement. We are in round 4. This is the story of Cameron Smith, a two year old little boy who should have been getting ready for his birthday celebration when he was diagnosed with cancer. After treating him for a common cold and teething, Cameron was not getting better so his mother decided to bring him to the doctor. Cameron was no longer eating on his own and she was forcing him to drink. After a few days of seeing the doctor, Cameron proceeded to get worse he now wasn't eating, drinking, walking, talking or staying awake. Once they were admitted into the hospital, Nina told them everything she had gone through with Cameron and they immediately took him and told her that they were going to test him for Cerebral Palsy and signs of a stroke. What they had found was a mass the size of a softball on the left side of her child's brain. They then told her that he needed to be air lifted immediately to Children's Memorial Hospital where he would be under going immediate brain surgery to remove the mass from his brain. Cameron's brain surgery was a complete success in removing the mass from his brain. A week later Cameron was diagnosed with a very rare form of cancer that only babies and toddler's get it is called ATYPICAL Teratoid Rhabdoid Tumor. This rare, high-grade tumor occurs most commonly in children younger than 2. It can be found anywhere in the brain. With Cameron only being a year and a half old radiation was not an option. He would under go very extensive rounds of Chemo which he is still currently going through. At this point, he has shown no signs of any regrowth on his brain.